Our work is to carry on the mission of Fr. Tadashi Hasegawa; to educate people about the terrible effects of nuclear weapons and by doing so, help prevent them from ever being used again. In 2010 Fr. Hasegawa published his biography in Japanese, describing his experiences as an atomic bomb survivor. He passed away from cancer a year later, but before leaving this earth his niece Agnes and her husband Richard promised him that they would have his story translated into English and published in the United States. The August 6 Foundation was created in order to carry out that promise. We do so by offering Fr. 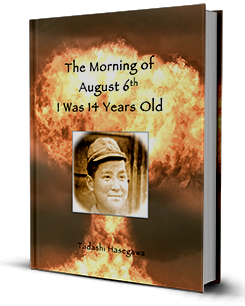 Hasegawa’s book, “The Morning of August 6, I Was 14 Years Old” as a free download on our website. If you would like to support our mission you can do so by spreading the word and sharing our website with as many people as possible, and asking your friends and family to do the same.